When it comes to choosing a real Christmas tree for your home or business, Gwynedd Christmas Tree Specialists are sure to have just what you are looking for. 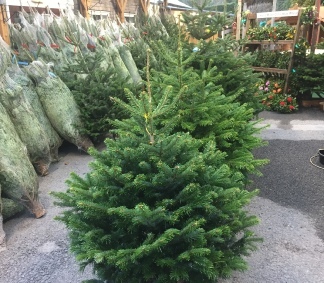 Our large range of fresh Christmas Trees come in sizes from 3 ft all the way up to 14 ft.
We have a good range of varieties for you to choose from and with prices starting as low as £24.95 we are sure to have the perfect Christmas tree for all. We supply traditional Norway Spruce Christmas trees, non needle drop Nordmann Fir, long needled variety Scott's Pine, space saving slim Fraser Fir. Christmas trees to suit all. This year our home grown in Gwynedd range of pot grown Christmas trees are available to buy. We have a large range of different sizes and varieties to choose from all grown at our nursery just outside Caernarfon.